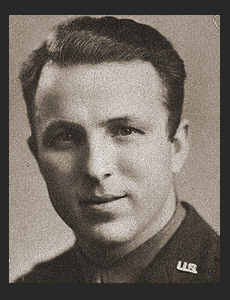 1st Lt. Glenn J. Fry, son of Mr. and Mrs. J. E. Fry, graduated from Frederick High School and Oklahoma City Univ. ; husband of the former Ruth Whiteside. Entered Army in July, 1942, trained in Ft. Sill, Okla., Camp Shelby, Miss. ; served in Africa, Sicily, Italy, Corsica, France, Germany, Austria and Belgium. Awarded ETO Ribbon with five Battle Stars, Good Conduct Medal, Occupation Ribbon, Air Medal with eight Oak Leaf Clusters, Victory Ribbon.